Two Sandians received the DOE Hydrogen and Fuel Cell Program achievement award. Pictured (from left to right) are Erika Sutherland (DOE FCTO), Brian Somerday, Chris San Marchi, and Will James (DOE FCTO). The Annual Merit Review and Peer Evaluation Meeting held on June 17, 2014, gave two DOE groups, the Hydrogen and Fuel Cells Program and the Vehicle Technologies Office, an opportunity to recognize exceptional achievement in specific areas. The CRF is especially pleased that retiring manager Dennis Siebers was honored with a Distinguished Achievement Award from the Vehicle Technologies Office “for lifetime achievement in understanding engine combustion and emissions processes, leading to cleaner, more efficient engines worldwide.” This award is a fitting acknowledgment of Dennis’s significant impact on and contribution to combustion science over the course of his career. 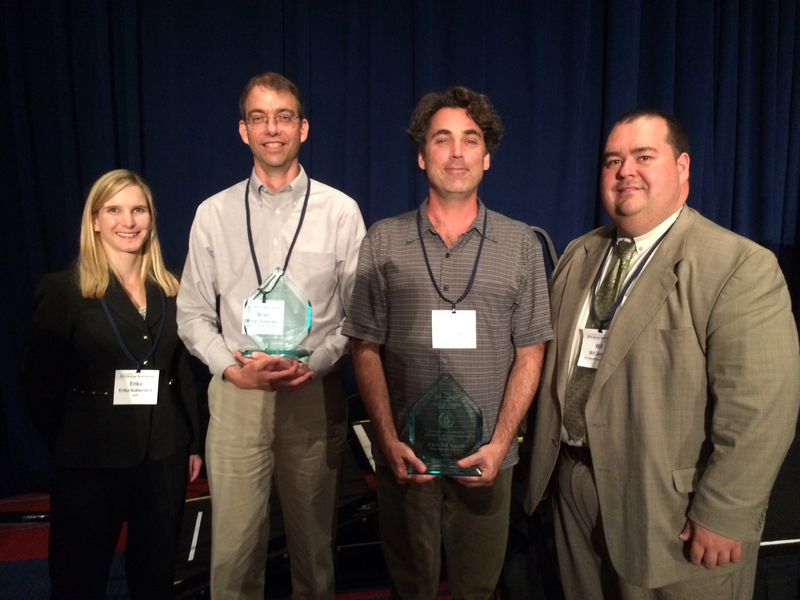 In addition, the Hydrogen and Fuel Cells Program recognized Sandians Brian Somerday and Chris San Marchi for outstanding achievements in hydrogen materials compatibility with a Program Area Award for Hydrogen Production and Safety, Codes, and Standards. Brian leads a research collaboration with Kyushu University that is developing predictive models for hydrogen embrittlement in metals and serves as Sandia’s lead of the newly launched H2FIRST project, which provides the science and engineering to advance a reliable and economic refueling infrastructure for hydrogen vehicles. Chris has been an integral part of numerous codes and standards development committees and has created several references on materials compatibility, including Sandia’s Technical Reference—the first hydrogen-specific reference from the Fuel Cell Technologies Office (FCTO) to be incorporated into President Obama’s Open Energy Information Initiative.